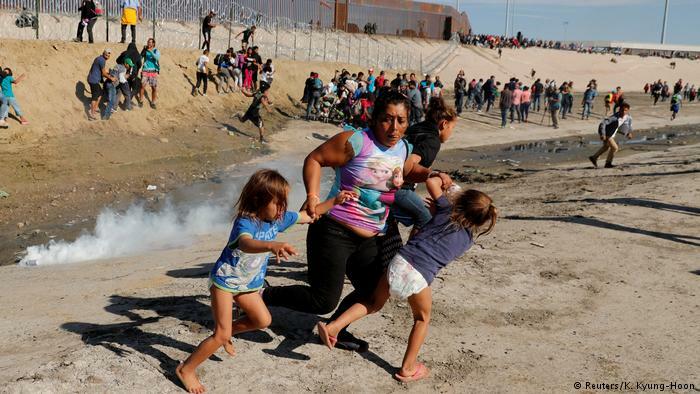 Originally from Germany, Guillermo Kahlo, Frida’s father, was a photographer who suffered from epilepsy and understood the major health setbacks his daughter experienced. 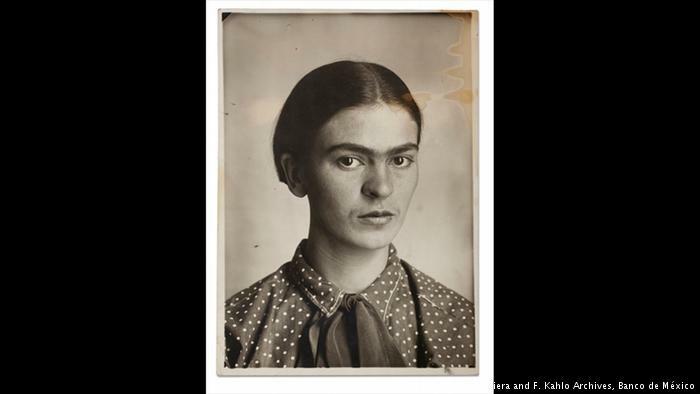 Frida helped her dad in his photo studio and would pose for him, “often gazing straight at the camera with her characteristic defiance,” said Ana Baeza Ruiz, a researcher for the V&A show on Kahlo. This portrait is from 1926. The exhibition, titled Frida Kahlo: Making Her Self Up, features over 200 of the artist’s personal objects, as well as paintings and photographs. “A countercultural and feminist symbol, this show will offer a powerful insight into how Frida Kahlo constructed her own identity,” said Claire Wilco, co-curator at the Victoria and Albert Museum in London. This 1939 photo was taken by Nickolas Muray. 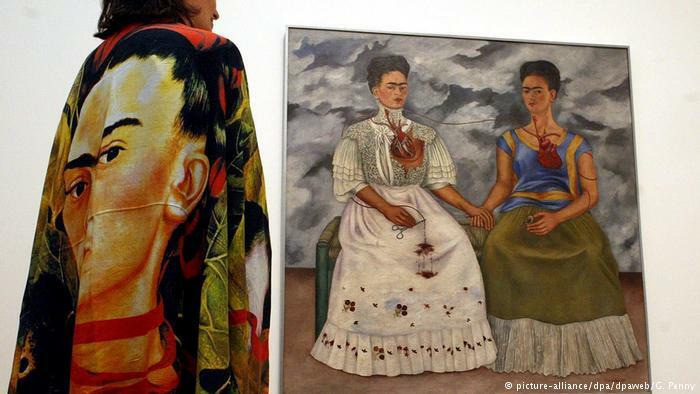 Kahlo used dress as a political statement, constructing her identity to mirror her own mestizo (mixed race) background and loyalty to her Mexican roots. 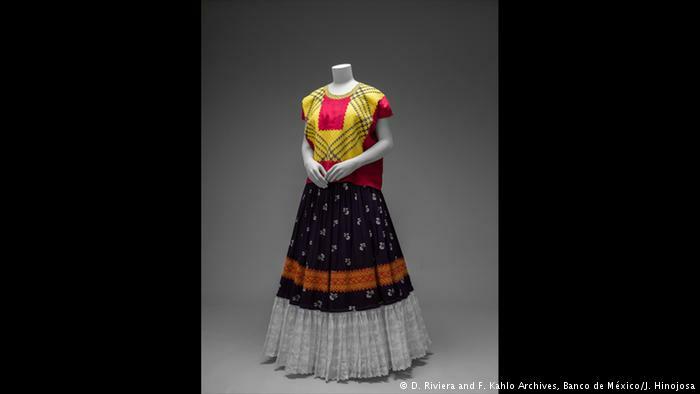 The exhibition includes garments from her personal collection, such as rebozos, a traditional Mexican shawl, huipiles, an embroidered square-cut top, enaguas and holanes, floor-length skirts with flounces, as well as Pre-Columbian accessories. 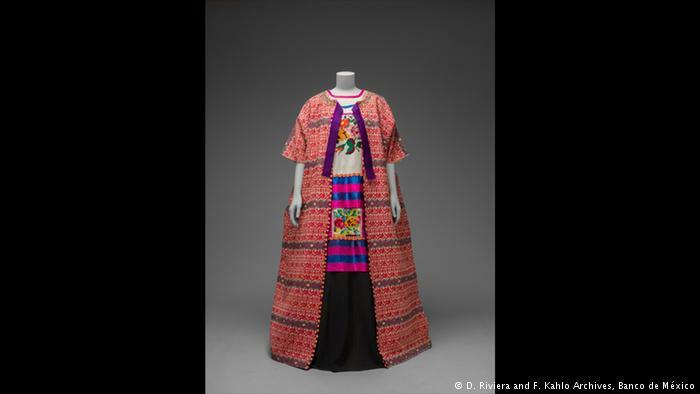 Through her art and style of dressing, like this Guatemalan cotton coat, paired with a Mazatec huipil and a floor-length skirt, Kahlo turned tragedy into creativity after a streetcar accident left her with lasting physical and emotional wounds at age 18. She was convalescent for months and at that time, she taught herself how to paint. 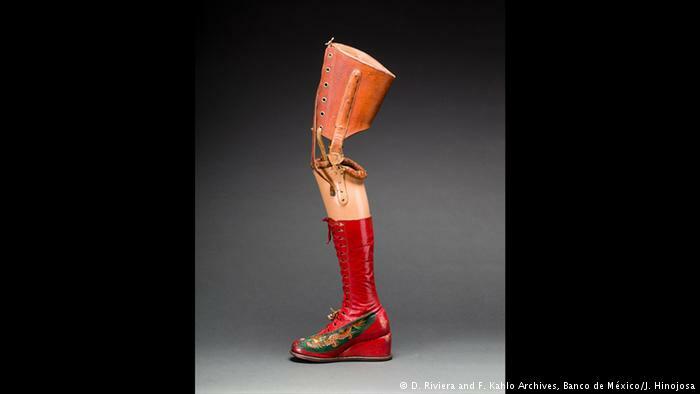 Items such as her medicine, orthopedic aids and this prosthetic leg with leather boot, featuring appliquéd silk and embroidered Chinese motifs are also on display. Kahlo owned many supportive bodices and spine braces. Some of the corsets she painted with religious and communist symbolism and tragic visuals tied to her miscarriages are also included in the exhibition. 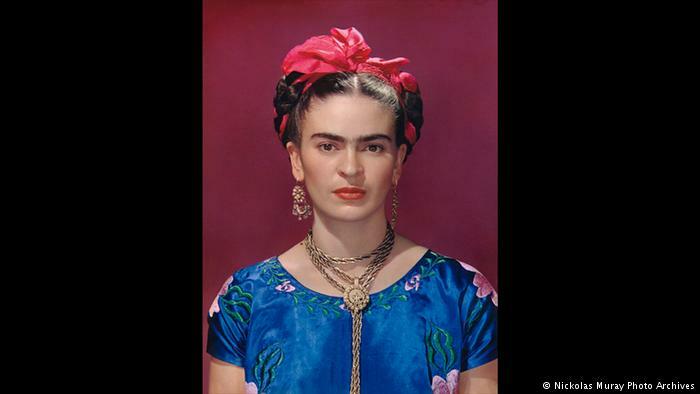 Going against mainstream beauty standards, Kahlo proudly emphasized her signature unibrow with an ebony eyebrow pencil. 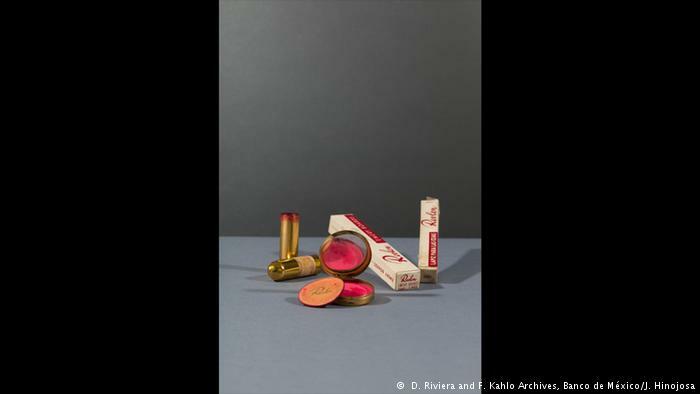 This and various cosmetics, still in their original packaging, are on show at the V&A exhibition. 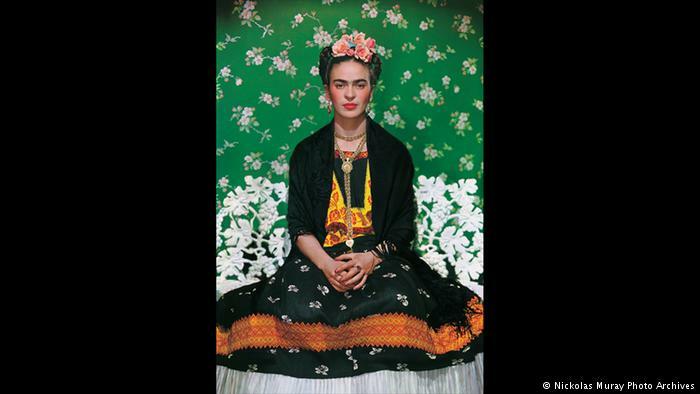 Her vibrant makeup highlighted her features, as the color portraits by photographer Nickolas Muray also show. 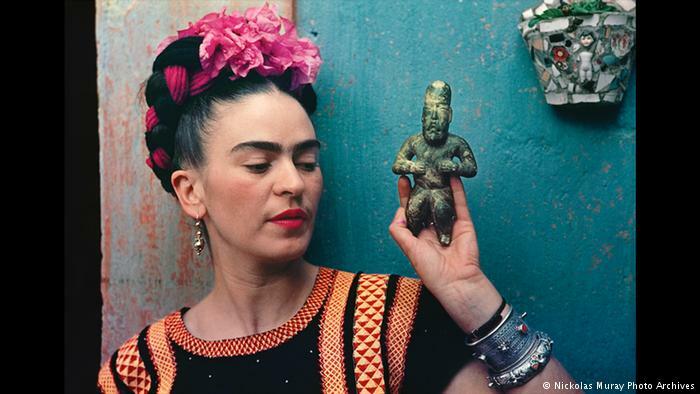 Hungarian-born American photographer Nickolas Muray shot some of Kahlo’s most iconic portraits. While she was married to Mexican muralist Diego Rivera, she also had a decade-long on-and-off affair with the prolific portrait photographer, and they remained friends until her death in 1954. Among the best known photos of the artist is this and the following portrait, both from 1939. Flower crowns. Thick braids. Unapologetic facial hair. Chunky accessories. Vibrant ensembles. These were just some of the features Frida Kahlo personally curated to sculpt her identity — from head to toe. Through items that have never been exhibited before outside of Mexico, the show Frida Kahlo: Making Her Self Up, held from June 16 to November 4, 2018, glimpses into how she achieved this.